comfortable as possible with the entire process. From the moment you approach our facility, you'll feel right at home. Built to look like a two-story dwelling, Dallas Highway Animal Hospital combines quality veterinary surgery and care, with a compassionate atmosphere. Our helpful and friendly staff is highly trained and will provide personalized treatment for both your pet and you. Our modern surgical center is well maintained and features new machinery and monitoring equipment. 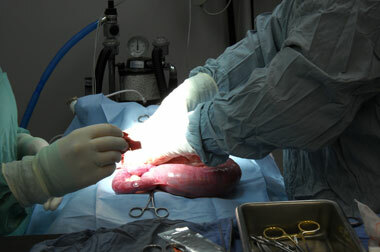 Its appearance and overall feel is that of an operating room you'd find in a hospital for humans. We process all pre-surgical blood work in house to ensure timely and accurate results, and every surgery is performed by one of our two veterinarians. Upon completion of your pet's surgery, he or she will be moved to a treatment area and monitored by a member of our staff throughout the recovery process. The personalized care doesn't end when your pet goes home. Every single one of our patients is checked on via a phone call from his or her doctor or a member of our staff. We truly pride ourselves on treating every single pet like they're one of our own. Microchipping is not considered surgery, but it can be performed while your pet is under anesthesia. For more information about our surgical center or the types of surgeries we perform, feel free to contact us today.